“We’re forced to get water from sources that obviously aren’t completely hygienic. But it’s enough for washing or doing the dishes,” said one resident, Manuel Almeida. “We’re going to bed without washing ourselves,” said one man, Pedro Jose, a 30-year-old living in a poorer neighborhood in the west of the capital. He walks for more than an hour to the bakery where he works in the upmarket Los Palos Grandes area. “At least I’m able to take a loaf back home,” Donaire said. In stores, cash registers no longer work and electronic payment terminals are blanked out. That’s serious in Venezuela, where even bread is bought by card because of lack of cash. “People need to eat. We let them take food and they will pay us when bank transfers come back,” explained shop owner Carlos Folache. “I’m trying to get connected to get news… on this chaotic episode we’re going through,” said one man, Douglas Perez. With Caracas’s subway shut down, getting around the city is a trail, with choices between walking for kilometers (miles), lining up in the outsized hope of getting on one of the rare and badly overcrowded and dilapidated buses or managing to get fuel for a vehicle. Pedro Jose said bus tickets have nearly doubled in price. “A ticket used to cost 100 bolivares (three US cents) and now it’s 1,500 (45 cents),” he raged. “We make lamps that burn gasoline, or oil, or kerosene — any type of fuel,” explained Lizbeth Morin, 30. 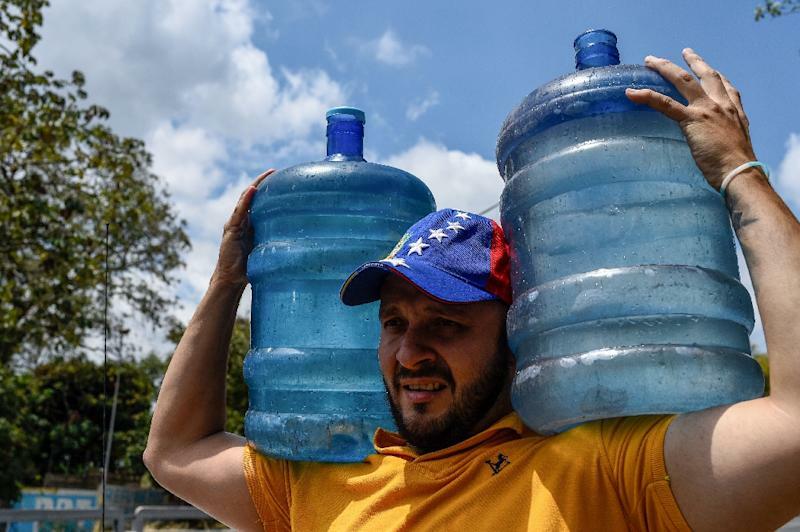 7 Comments on "Venezuela returns to ‘Middle Ages’ during power outages"
Get a water filter. If you don’t have one of these you have not been paying attention. Another former ‘peak oil’ star bites the dust. Mexico has been a net importer of oil for several years. Covered up by the fact that Mex does export crude to the US. However, we export that crude oil BACK to Mexico refined into gasoline, diesel & jet fuel. So, when we add Mexico and Iran and Venezuela to the list, it’s no wonder the government is fighting tooth and nail keeping PoO in check. I don’t care how much BS gets thrown, at the end of the day, we lost that battle but damn few realized we were even at war. will crop up an unexpurgated copy. Or, the tide goes out and we see who is naked. Clearly, Mexico is no longer adding to world oil supply. Mexico now sips from your milkshake. The pity is Darrell, folks with little money can’t afford a reverse osmosis filter. RO is very slow going. One NEEDs running water at at least 40 lb psi. The best filters are out of question. Oh, replacement filters for RO can cost over $100 a year and up depending on how crappy the water. I let mine run for about a half hour into a stainless tank for a six day supply. Our farmhouse water is supplied by nature. It is called rain. Where we live, it averages 12 feet per year, and is fairly evenly distributed. Even in the dry season, it rains every few days. The system and tanks are on the roof and water is fed by gravity when there is no electric. Since the rain comes in from the Pacific, it is fairly clean. The system provides about 40,000 gallons per year. Imagine a cashless economy with the grid going down. Venezuela is a precursor of such a scenario. Building up a complex society takes centuries. Reverting to barbarism a few days. Imagine the US when the grid goes down…permanently. 90% dead in a year according to some estimates. The rats and roaches would feast because burial would be impossible for that many. About 294,000,000 or almost 900,000 per day. 36,000 per hour. 600 per minute. 10 every second. How long would it take to destroy the grid? Hmm. How long does it take for a nuke to explode over Kansas? A millisecond? Which foreign satellite caries the nuke over the US everyday? After all, there are almost 2,000 up there and more all the time. And with nuke missiles now being installed in shipping containers…which American port will it come from? How would YOU manage if there was no electric anywhere, ever again? Think about it.